As soon as I saw the link to these pancakes I had to come here and now I must try these (managed to miss them in Cuisine). 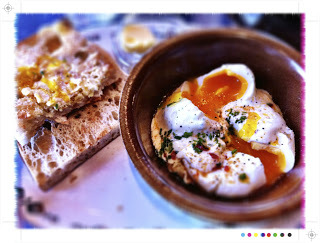 Wow, fantastic breakfasts and the one at Queenies looks so good - might have to go there next week. Loved the quotes especially Pooh which is so spot on - my daughter always cooked the pancakes from the Pooh cookbook! Thanks Lesley, I am loving the latest issue of Cuisine...even subscribed! And I cannot believe you have never been to Queenies....you must go!! You will love it! I have so enjoyed making and eating breakfasts over the holidays - brunch every day has been such a treat. I'm still trying to perfect a wheat free pancake though. These look lovely, so fresh and fruity. As soon as I saw these I thought they must be some wonderful trick to eat cheesecake for breakfast. Passionfruit cheesecake disguised as wholemeal pancakes. I like your style. Balance :) And dessert for breakfast why not?? ?